“We need chutzpah to face down those people who say “ Hey who are we to say technology should dictate what children learn, that technology should dictate the curriculum. No! Technology should be the tool for implementing the curriculum. It’s other people who dictate it. Who do you think you are to say what children should be learning? Moore, A. (1998) Seymour Papert quoted in archived article, Targets Hit, Targets Missed — Seymour Papert, chronicling his speech at the October 1998 Camden Technology Conference (now PopTech). The actual video of the event has been lost to the Web. THE DAILY PAPERT NEEDS YOUR HELP! 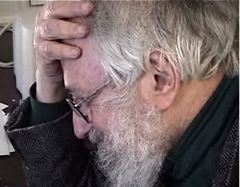 There are a dozen or so hours of rarely or never-before-seen speeches by Seymour Papert in audio and video form that we need to have transcribed. An hour of video transcription costs $60-$100. Please consider chipping in anything you can.